In the FA Cup draw made earlier today the Harriers found themselves facing a long jaunt over to Kings Lynn in East Anglia. The game, to be played on Saturday October 25th, will be the second time that we have played a Cup tie at The Walks. The last time was in the 1984-85 season when we lost the replay 1-0 after drawing the first game 1-1 at Aggborough. 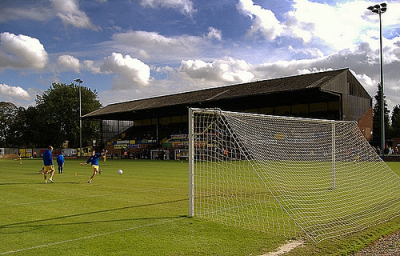 The Linnets went on from that game to play at Bristol Rovers in the next round. We have played them eighteen times between 1972 and 1984 with the majority of the games while in the Southern League. Kings Lynn now play in the Blue Square North where they lie at 9th place in the table at this minute. Their ground is named The Walks and has a capacity of 8,200 with 5,000 under cover, and 1,200 seated. They get quite good gates seeing an average of around 1150. They also have a smattering of well known players in their side with the standout ones being former Harrier Simon Weaver and the ex Villa striker Julian Joachim. Also with them is Ben Sedgemore - the brother of Jake Sedgemore - and the former Bristol Rovers keeper Scott Howie. Their Official site is here and their forum is here.